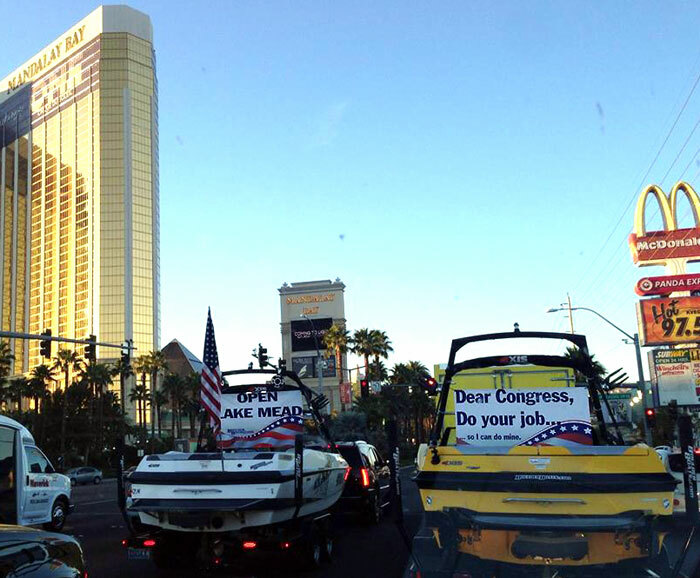 LAS VEGAS (AP) — Boaters who say they are fed up that the government shutdown is keeping them off Lake Mead took to the Las Vegas Strip in protest. About 20 boats were towed through the tourist corridor between 6 p.m. and 7 p.m. Oct. 6. People passing by the watercraft honked their horns and shouted out of their windows in support. Organizer Stuart Litjens said he is frustrated by the government gridlock’s effect on small businesses, including his own company, Boulder Boats. He estimated that he will lose half a million dollars in boat sales if the shutdown continues for a month. Lake Mead National Recreational Area is one of several parks around Las Vegas that are affected by the closure. Boaters said Lake Havasu, 2.5 hours away, is one of the closest bodies of water still open.